Más is regional high-speed rail for Los Angeles with a landscape to match. It diversifies the communities in the built environment, making travel less necessary, easier and more predictable, and bypassing roadway congestion through a new raised infrastructure. A partnership between the public and private sectors creates varied opportunities for organic development. Travel times improve over time with the addition of new trains. Más also links local and inter-regional commuting; providing frequent service that will sync up with the California High Speed Rail network. San Diego via más is less than an hour away, including transfer times; San Francisco is less than three hours away. ---The high-speed train would be elevated and follow the path of the existing highways. It would link existing bus and subway lines. ---One of the inspirations for the high speed rail is the 24.1 mile Yamanote Line in Tokyo, a circular route that connects major cities, but also serves as a rail and bus connector. There are departures about every two to four minutes in each direction. But unlike masTransit’s rail, that rail isn’t high-speed. 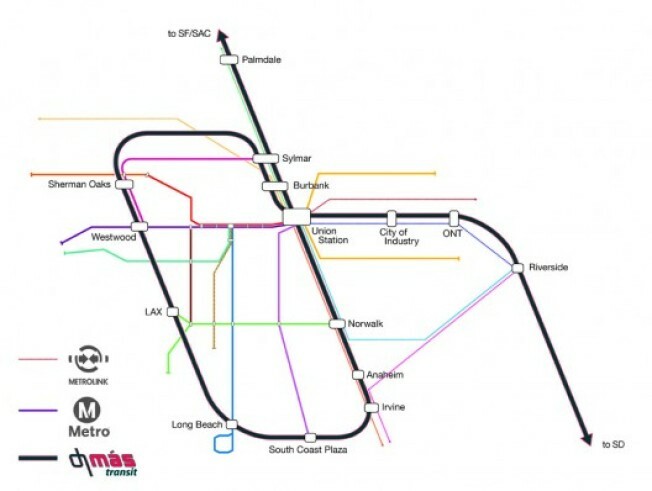 ---According to the team, the same route wouldn’t work with light rail because car goers would still be able to travel faster than the subway ie any type transportation that doesn't beat the car isn't going to work in Los Angeles, according to the group. ---The trains would reach speeds of 100-250 miles an hour. High speed train technology does have the capacity to speed up and slow down that fast between stations, according to the team, but the cost of using that technology wasn’t analyzed as part of this proposal. --- In cases where there are existing subway stations, the high-speed rail stop would weave into the neighborhood. ----The model specifically links land use policy and transportation. Rather than a corridor idea, where development follows a linear path of development (for example, the type of development near Wilshire Blvd), the idea is that development follows a mat-like pattern, spreading out into the neighborhood. For example, right now a high-rise or larger building is usually placed right next to a transit line, but one block behind that is a single-family home. This approach looks to phase in a mix of development. ---About 80-90 percent of single family homes around the high-speed nodes would disappear in the next 30 to 40 years. What would follow would be an organic phasing in of development. Figured in the equation are so called hold-outs, ie, people who won’t sell their homes. Team wants to bring density and development further into the neighborhood. A “light forest” approach rather than clear-cutting is imagined. ---The proposal really breaks down the idea of neighborhood. One of the points raised during the panels was the notion of neighborhoods are passe. Transportation has to be thought of as national, as linking national destinations, not just regional destinations. ---The entry also challenged the notion that Los Angeles hs a city center, challenged the notion that everything has to go out and into Union Station ie transportation has to have a central hub. -----OK, but could we do this? Well, maybe. The biggest obstacle is public resistance to the planning part of the model, according to Genik. There will be resistance when we "tell people they will lose their homes," said Genik. "I would say this is 30 years away," he said. Additionally, this Friday from 2-4 pm, there'll be an event to discuss the winners at Metro's headquarters (Windsor Room, 15th Floor, One Gateway Plaza, Los Angeles). Bustler has a set of all the winners. More about the event and full list of sponsors via Sci-Arc web site.